multi-platform Python toolkit for managing numerical simulations. parameter space beyond simple grid searches. in a single HDF5 file. data, Pandas DataFrames, and BRIAN(2) quantities. suited for both short Python scripts and large scale projects. Robert Meyer and Klaus Obermayer. pypet: The Python Parameter Exploration Toolkit, 2016. http://pypet.readthedocs.org/. 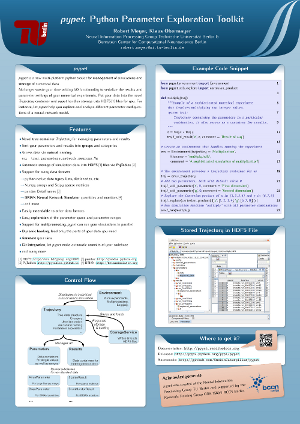 There is a poster about pypet that was shown at the Berlin Brain Days 2013 and the EuroPython 2014. Tests can be found in pypet/tests . Note that they involve heavy file IO and you need privileges to write files to a temporary folder. The test suites will make use of the tempfile.gettempdir() function to create such a temporary folder. Each test module can be run individually, for instance $ python trajectory_test.py. You can run all tests with $ python all_tests.py which can also be found under pypet/tests . You can pass additional arguments as $ python all_tests.py -k --folder=myfolder/ with -k to keep the HDF5 and log files created by the tests (if you want to inspect them, otherwise they will be deleted after the completed tests), and --folder= to specify a folder where to store the HDF5 files instead of the temporary one. If the folder cannot be created, the program defaults to tempfile.gettempdir(). If you do not want to browse to your installation folder, you can also download the all_tests.py script. Running all tests can take up to 20 minutes and might temporarily take up to 1 GB of disk space. The test suite encompasses more than 1000 tests and has a code coverage of about 90%! pypet is constantly tested with Python 3.4, 3.5, and 3.6 for Linux using Travis-CI. Testing for Windows platforms is performed via Appveyor. The source code is available at github.com/SmokinCaterpillar/pypet.